One of the best William Shatner movies is now available in the public domain. 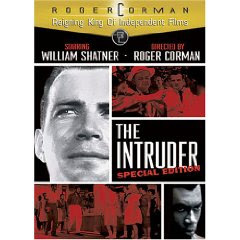 The Intruder (aka Shame) directed by Roger Corman tells the story of a racist instigator who visits a small town and leads a backlash against the integration of a school and an incident between a black lad and white girl soon after. Filmed in a real town and much of it with the townsfolk unaware of the real story of the movie it is a masterpiece of it's time but lost money and become Cormans one financial failure yet is rated by many as his best movie.